A Medium-Duty truck built to make a living. The T170 is a Medium-Duty with some heavy thinking behind it. Ready for a medium-duty truck that will likely outlive the body you put on it? Then take a close look at the Kenworth T170 – a truck custom engineered and built with your long-term business goals in mind. Start with a versatile, rugged and reliable chassis capable of tackling the toughest jobs you’ve got. Then add advantages like contemporary aerodynamic styling, great visibility, excellent maneuverability, a driver-pleasing premium interior and quick single point daily maintenance checks. Trucks you can count on – day in, day out. 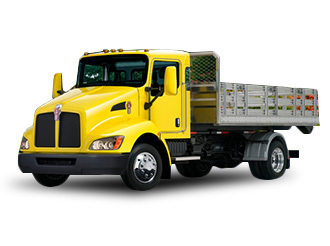 A straight truck in a 4 x 2 configuration with a gross vehicle weight rating up to 19,500 lbs, the Kenworth T170 is a robust Class 5 model designed to go the distance.